Villa Tourkouaz stands majestically on the cliff and offers breath-taking panoramic views. The villa was built according to the architectural Zakynthian tradition with natural stone and is beautifully decorated. It has four spacious en-suite bedrooms, a private infinity pool with hydro-massage area and also has direct access to the sea. It is a perfect choice for a family or a group of friends. The spacious kitchen is fully equipped and includes: cooking utensils, gas oven, gas/electric hob, fridge/freezer, kettle, microwave, toaster, juicer, filter coffee machine, dishwasher and washing machine. There is plenty of space for all the family to join in at mealtimes, whether preparing or just chatting about the day's adventures. On the first floor of the villa is an ensuite master bedroom with an additional single bed. On the ground floor there is a double bedroom, a twin bedroom, and a double bedroom with an additional single bed. All of these bedrooms are ensuite. 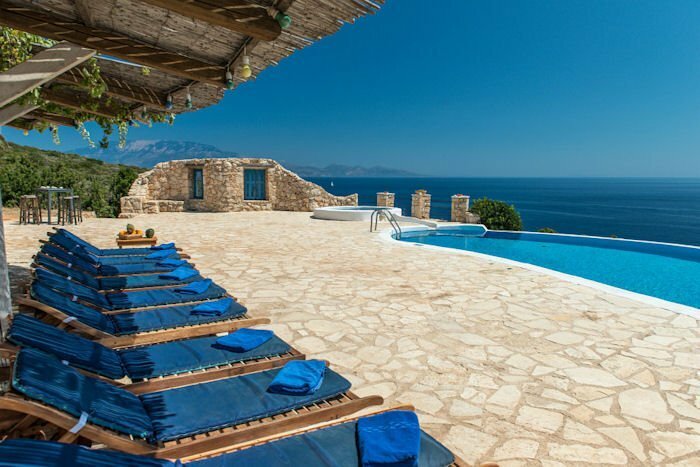 The fourth bedroom of Deep Blue Villa is a private, self-contained, comfortable guesthouse overlooking the sea, pool and Kefalonia with a capacity for two-three people. It features its own entrance, open plan kitchen and large bathroom, while it's fully equipped with home appliances, TV, Hi-Fi and is also air-conditioned.